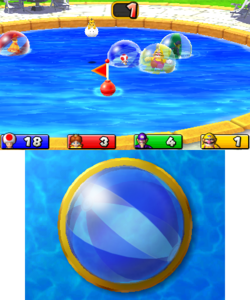 Pool Buoy (Beach Ball Bedlam for Europe and Australia) is one of the General minigames from Mario Party: Island Tour. This minigame's name is a pun on the term, "pool boy". The players are inside beach balls in a circular swimming pool. They can move by sliding the on the ball on the bottom screen. A Lakitu keeps roaming above them throwing flag buoys for them to collect. Red buoys are worth one point, while golden buoys are worth three. The player with the most points wins the game. Rules – "Race around the pool, and collect as many flag buoys as possible." Spanish ¡Balones al agua! Balls in the water! Burya v bacceyne Storm at the pool. "Буря" is a pun on "буй" (buoy). This page was last edited on December 23, 2017, at 01:10.